Alex Shams is an Iranian-American writer and a PhD student of Anthropology at the University of Chicago. He was previously based in Bethlehem, Palestine, where he worked for Ma'an News Agency, the largest independent Palestinian news agency. The Persian New Year 1391 is upon us and it seems that yet again that we will celebrate amidst a climate of global fear and relentless persecution. In Turkey, the police have cracked down on Nowruz celebrations and at least two are dead already as the country braces for mass demonstrations in support of greater cultural and political freedoms for the Kurds. In Afghanistan, millions wait for justice after the US military occupation’s latest massacre, and in Iran the national currency’s value has halved in recent months as the country braces for the latest round of sanctions to take effect, this time cutting off Iranian banks (and hence Iranians) almost completely from the global financial system. Even a friend of mine who sometime ago figured out how to outwit the US sanctions regime and open a side account in a Tajikistani bank is feeling the heat, as we found out when his card was declined when he tried to pay for our pre-New Years Chinese meal in New York this weekend. The Vernal Equinox (which usually falls around March 19-21) marks the beginning of Spring globally and is the first day of the Persian calendar, a fact that is celebrated across the Perso-Iranian cultural continent by millions, including by those who no longer retain the calendar itself. Nowruz, meaning “New Day” in Persian,” is originally a Zoroastrian tradition, but today is shared by peoples of all faiths. Of course, this is not the first time we are ringing in the Persian New Year in a climate of such tension, nor will it be the last. In Iran itself the holiday’s meanings are deeply contested, as pro-regime hardliners regularly decry Nowruz’s Zoroastrian roots and opposition protesters use Chaharshanbe Soori, a nocturnal celebration that involves jumping over bonfires, to set trashcans alight in protest. 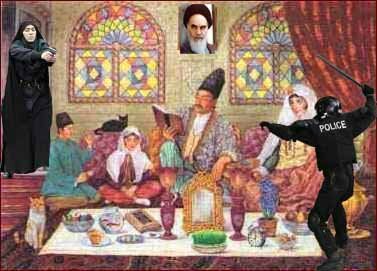 Last year, in the wake of two years of relentless political crackdown following the 2009 election, I drew up this spoof on a traditional Nowruz scene, capturing the feelings I had as the Arab World rose up in rebellion and Iranian protesters were assaulted pre-emptively, lest they forget the Islamic Republic’s stance on Egypt-style regime change at home. But these realities have never quite killed the holiday or dampened our spirits too much, and in both the worst and best of times Iranians, Tajiks, Afghans, Uzbeks, Kurds, Armenians, Azeris, Kazakhs, Turkmens, Georgians, Kyrgz, Bahai’s, Alawis, Alevis, Albanians, and anyone I may have forgotten who takes part have celebrated and rejoiced in this sacred transnational celebration of rebirth, renewal, and resistance. As we emerge from the cold of winter, resisting the all-encompassing darkness of these months and yearning for a better future, Nowruz reminds us of our coming triumph, of the victory of spring over winter that will soon cover the world in joy and which will lay the ground for us to rebuild an alternative reality. This alternative reality is the resistance against war and aggression that we are witnessing, the women’s rights activists in Iran speaking out against war, the wave of mass protests across America last month in opposition to sanctions and assassinations, and the messages of love for the Iranian people sent out by ordinary people from Tel Aviv in the last few days. This alternative reality is the optimism of the Kurdish protesters, the steadfastness of the Afghan people, and the millions upon millions who live their lives and prosper in the face of the aggression, brutality, and neoliberal warfare that has been waged across the Central Asia and the Caucasus in the last few decades. This alternative reality is the spirit that infuses the lives of Iranians, brutalized by their own government and economically targeted by almost every other. We enter this New Year bravely and with renewed hope at the potential for our own rebirth as well as the world’s, inspired by the wave of Revolutions across the Arab World and by the Occupy Wall Street uprising in the heart of the American Empire. Even as we face the casual brutality of the Turkish armed forces, the systemic violence of the US military, or the repressive fist of our own police forces, wherever we may be, we are filled with hope at the message of Nowruz and the firm belief that another world is, in fact, possible.